This time of year is always so wonderfully chaotic for everyone. For me, I've closed a major chapter in my life by finally finishing my Bachelor's degree. Now, I'm in the midst of applying for jobs and preparing for upcoming interviews. Throw all of that into the mix with holiday parties, volunteer work with my husband's unit, and taking care of household stuff, it doesn't leave much room for serious crafty time. Thankfully, with the help of wonderful friends like my fellow Retro Cafe Art Gallery team members, I'm learning that bigger doesn't always mean better and that the small is just as beautiful. This ornament was put together in about an hour including the bead work (which I've gotten quite nimble with). First, lay down a nice coat of gesso then go over it with Snow-Tex paste. If you don't have this wonderful faux snow paste, modeling paste is just as effective. While it's still wet, sprinkle some Glamour Dust or any other white or clear glitter you have lying around. I like to add my embellishments while the paste is still wet so I can embed them slightly. It provides a nice stable base but it also lends a slightly more realistic depth with the paste creeping up the sides of your embellishments. Add bead work. For mine, I used my usual needle technique and applied each bead one by one. You could also use gel medium and micro beads or even some velvet flocking. Frosty's dear face was also done with beads. They are glued down but I also smooshed them into the snow paste. Finally, just finish him off with some fancy buttons or beads and a bow for his scarf. There is always something purely magical about handmade ornaments on a tree. Sure, the ease and convenience of beautiful store bought is appealing, especially to me as I am very busy all of the time it seems. But handmade just lends a genuine one of a kind look and always seem to stand out to me. It's good thing Retro Cafe Art Gallery has a plethora of cut-outs and pieces to make any kind of ornament regardless of style! These little beauties are made from the Deer Mount cut-outs and are super easy to do. Step 1: Paint your base. I used metallic acrylic paint and when it was dry, I stamped over the top with a funky cool filigree pattern. Step 2: Cover the adorable deer heads with patterned paper. Glitter the antlers and add itty bitty tied bows. Step 3: Add final touches. I used plain white dresden as my border. You could use twine, string, or even wire for the hanger but I opted for gold chain and jump rings. This type of project is perfect for gift giving, ornament swaps, or even for use as gift tags. I worked in an assembly line fashion and not including drying time, these were done in about an hour! Can you believe that?! Stay tuned here for more Christmas and holiday decor items! I admit it! I'm a sucker for pretty paper! The paper I used for this Halloween gem for Retro Cafe Art Gallery I have been holding on to for years. You see, I started out as a scrapbooker so I had built up this massive stash of paper. Fast forward a number of years and I realized that I am probably done with the scrapbooking arena and have my feet firmly planted in the realm of mixed media. However, the urge to play with paper comes along every now and then and I have to dig through the very little paper I kept and put it to good use. This piece uses K & Company's "Que Sera Sera" paper pad. One of my favorite things to do is to make the simple look complex and complicated. Jackolynn was constructed using the simplest of techniques. You'll be amazed. Step 1: Grab that paper you've been hoarding and get ready to hack into it. Trace each piece and cut them out. Glue each cut piece to its substrate. See that file in the photo below? It is THE key to get nice, flush, and fresh edges. Step 2: Use an ink pad to ink your edges. Ready for the mind blower? Embossing powder! Get your embossing pad and powders and go to town on those edges! Step 3: For the base, add moss for an instant upgrade! Step 4: Assemble your pieces and admire at how simple it was to do! I have received quite a large number of requests on how I did the finish on my Crown of the Ocean. Because of the response this piece received, I decided it's time to share just how simply this aged finish is to do. Keep in mind that I am not replicating this finish exactly. I am using a different crown base with different colors because this base will be used on my next crown. You'll have to stay tuned to see how it turns out! Stand by to be blown away at just how easy this is to do! Step 1: Coat crown base in gesso. I do this so that the paint that will be applied in the next step stays nice and vivid without absorbing the chipboard color. Step 2: Apply acrylic paint with a sponge brush. I brush it on and then dab over it to give it a rough finish. It's also a great way to hide brush strokes that you don't want to be seen. Step 3: Once the paint has dried, use a sponge brush and randomly dab the iron paint from the VerDay kit onto the base. Remember, perfection and precision are the enemy here. Spray with patina spray and apply second coat according to product instructions. Once it has cured, about 4 hours, this is the finish you end up with. Step 4: Be sure to carefully read the directions on the bottle of leafing adhesive. If it is applied incorrectly, your leafing will not stick properly and will flake off. Once your adhesive has dried for the requisite amount of time, stick the leafing on like you would do foiling. Again, precision is not the goal here. We want a random, muddled look that adds to the aged finish. Step 5: Use a SOFT paintbrush and brush away the excess leafing and finish the edges. If you notice you have some hard edges in the leafing, simply scratch at it with your finger nail. I recommend using a cheap synthetic watercolor brush. A hard brush will remove the leafing. Keep brushing the leaf and finishing the edges until you are happy with how it looks. You can also reapply the adhesive and leaf to cover any "holes" you may see. Step 6: The easiest way to I have found to shape the crown without creasing it is with a heat tool. Gently heat up the chipboard bases from behind and slowing shape the crown until the ends connect. Take your time and be patient otherwise you will end up with creases. Connect the crown pieces with the brads that are included and call it done! The wonderful thing about this finish besides how simple it is to do is the crown could be considered complete at this point. It's such a beautiful and high impact look that any further embellishing is not necessary. However, if you're like me, more is more! Hi everyone! I'm back today to share with you a project that was intended to go one direction, but in the end, took on a completely different idea as one idea failed and another proved to be fantastic! I wish I had taken photos of the mishaps that forged the road ahead for Gabriella, but alas. I did not. In all honesty, I think I was too frustrated to even think about grabbing my camera. You see, at first, she was going to have the face of Frida, but since that idea fell apart, more like broke upon my floor (literally), I decided to go in a different direction instead. I have had this beaded beauty in my cabinet for some time now, just waiting for the perfect piece to put it one. And talk about serendipity! If you have followed me for a while, these pieces are hand beaded one by one using a needle, glue, seed beads, and micro beads. Her "halo" is a piece of magic in itself. I also wanted to try my hand at painting. Not just regular shading, full color type painting. Actual images in the vein of tole art painting. I knew Gabriella was going to have a mix of cultural infusions and I wanted the shrine to be of a Mexican folk art style. The inside of the shrine is a very cool printable from Xquizart that simply enhanced the look I was going for. Gabriella's heart is always at a low and hot smolder. Passion for life, even in death is her mantra. Would you like to know the secrets in assembling this piece? Step 1: I always prep my pieces with gesso simply because I almost always end up painting them. Step 2: I used Sandra Evertson's "MUSE" stamps and stamped into Apoxie Sculpt. I cut the excess clay away and used them in other moulds. You notice the Frida face? Yeah, well, she broke when I dropped her, thus the change in direction. You can paint the pieces without the clay being dry. It's perfect for us impatient types. Step 3: Draw your design onto your pieces. I used a pencil and then painted it in with acrylic paint. Step 4: Trace panels onto paper. Cut and glue them to each piece. Step 5: Highlight the flowers with a white pen and ink edges. Step 6: For Gabriella's smoldering heart, paint a base coat of acrylic paint. Once it dries, apply a thick layer of Kroma Crackle that has been tinted with acrylic paint. Heat set it with a heat tool. This technique is one I learned from Michael DeMeng. The Santos heart that serves as Gabriella's bodice was done using a faux Kintsugi effect which I demonstrated on Facebook. You can find the full video here. Assemble your pieces using an industrial glue like E6000 or Goop. Large Exquisite Santos Doll Antiquity Shrine Kit Relics & Artifacts® "Rising Spirit IV with Wood Support" Relics & Artifacts® "Flaming Hearts Ex Votos I" Relics & Artifacts® "Ancient Soul" Sandra Evertson "MUSE" Art Stamps "Mandala" Sandra Evertson "Muse" Art Stamps "Muse" Kroma Crackle E6000 Industrial Adhesive Xquisart "Hippie Chick" Tumble Fish Studio "Cut apART" Signo Uni-Ball White Gel Pen Liquitex Acrylic Paint StazOn "Jet Black"
I remember when Kristin first came out with this beautiful Escutcheon Plates. They were unique, simple, beautiful, and I had to have them. Buuuuuuuut I didn't know what I wanted to do with them. Until now. I've recently developed a newfound love for dies and my kids got me this Tim Holtz butterfly die with coordinating embossing folders and I've never used it. Until now. As many of you already know, I also love Relics & Artifacts and will continue using them when I can. Especially now. You know what else makes me all sort of giddy? When friends come out with cool stuff to use. Like Lynne Moncrieff's stamps. Would like to see how I put all of the elements I love together? Step 1: Prepare your pieces with gesso. When gesso dries, use an adhesive and sprinkle glitter onto the plate. Step 2: Cut butterfly and emboss with coordinating folder. Paint with acrylic paint and highlight with Inka Gold metallic rub. Step 3: Paint framing element with acrylic paints. Step 4: Use the flourish stencil and acrylic paint over the glittered doorplate. Step 5: While the doorplate dries, paint the Flora piece with acrylic paint and highlight with a lighter color. Step 6: Stamp sentiment and cut works apart. Step 7: Chalk the edges of each paper cutout and arrange on doorplate. Step 8: Add beading detail. Simple stuff using elements we all love! Hi everyone! I've gotten the crown itch again and this is one I've been wanting to do for what seems like forever. My heart has always been drawn to the sea. I always feel rejuvenated and at peace when I set on the sandy beach and stare out at the horizon. This crown is the result of my combine respect and appreciate for what the ocean gives us and the power it wields. It is full of life and just has it harbors it, it can easily take it away. It has the power to render things from the small and insignificant to the mighty and regal, aged and fragile. Here's a brief tutorial on how I put this Crown of the Ocean together. Because this piece never had a completed vision in my mind's eye, I do not have proper stepped out photos. This was totally a "fly by the seat of my pants" kind of project. All I knew when I started was that I wanted it to be a sea theme. Step 1: Paint your crown base with acrylic paints, both matte and metallic. Once it dries, get the oxidized effect using any number of patina-creating kits out there. After the patina fully cures and dries, apply gold leafing randomly all over the crown. Dress it up with some dresden trim that has been treated with patina. Finally, glue ball chain around the crown. Step 2: Paint your fancy shells using white gesso. Apply a coat of opalescent paint in the center of the shells. Use gold acrylic paint to dress up the outside edges and bring out that shine with a high impact metallic glaze. I used Tattered Angels High Impact paint in "Antique Gold". Use a paintbrush and spread some resin on the inside of the shell and sprinkle some microbeads and add a pearl. The resin seals in the beads but it also looks like water. Step 3: Use the coral fans as embellishments! 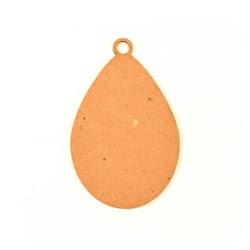 Dress them up with Iced Enamels "Carnelian" or any other corally color you have. You could even mix paints to achieve just the right orangey shade. Step 4: Start attaching your pieces to the crown base. I started with the heavy shells first and then built around them. You also will want to use a very strong glue like E6000 or Goop. make use of those shells you found on your last trip to the beach! Keeping them au naturale adds a softening contrast against the glitzy gold and vibrant coral. Step 5: Finish by attaching starfish. I left mine their natural color so that the color of the coral is tied in with the rest of the crown. Now sit back and admire your crafty genius! Oh man does it feel GREAT to be back! When the lovely Kristin of Retro Cafe Art Gallery decided to take some time away in order to prepare for the arrival of her gorgeous daughter, I thought it would be a good time to just relax, enjoy the down time and focus on other avenues such as school. Now that the shop is open, it's time to give this space here a little much needed TLC and what better way to start off on a new foot than sharing my HEART with all of you! I'm always a sucker for shrines, shadow boxes, and niche boxes and this is one I've had in my stash for some time now. To sit down with the pieces and paint and just let the process take over was pure magic. 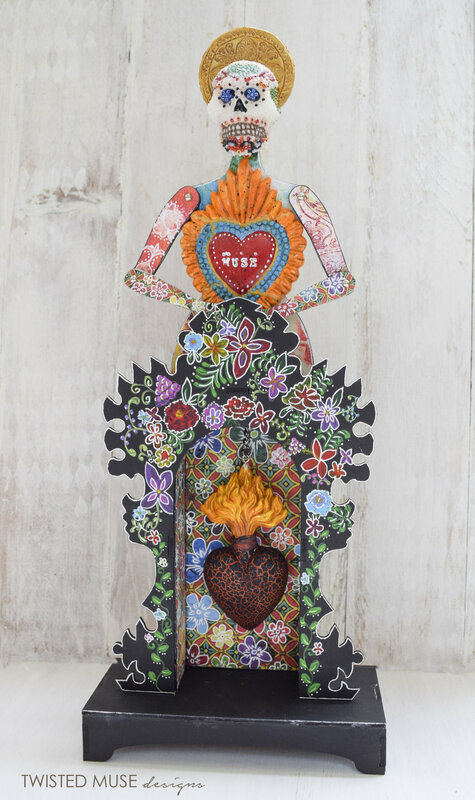 After seeing some beautiful Mexican folk art pieces by my fellow Art Sister, Kim Collister, I was inspired. I just let the vision in my mind flow through my hands but at the same time, I wanted to keep an element of traditional inspiration in the piece. Shall we take a journey into my technical process? Step 1: Prep your Fancy Flaming Heart Milagro Shrine pieces with some gesso and color those babies! Go wild, honey! Go. Wild. Step 2: Bust out that acrylic paint and sponge brush and go to town! I like the bumpy look so I dabbed the paint onto the heart rather than brush it on. You can also dab it onto your hands. I may or may not have done so myself. Step 3: Add more color and accent with some shading. Like splatters? Then splatter away! (Mine ended up getting covered up, but I'm okay with that.) Step 4: Glue everything together. If you are like me and use E6000 or Goop, don't forget to open a window. I think I may have gotten a wee bit loopy unintentionally huffing the Goop. I'm a sucker for beads and if you've seen my work, you'd already know this about me. Why should this piece be any different? Step 5: More fine beading on the flames and tips. For the niche, add some glue and dump some microbeads into it. Why wait for that glue to dry? Bust out the Goop (and a fan!) and glue your charm in. Lovin' my dainty border? Take a length of seven of the small daisy chain dresden and cut that baby in half. Be sure to use super sharp scissors! Step 6: Make a margarita, sit back, and just admire your creative process! Thanks for stopping by and I hope you enjoy not only my return to blogging but the re-opening of Retro Cafe Art Gallery. I'm sure I speak for the rest of my Art Sisters by saying we are thrilled to be BACK! Can you believe we are already getting ready for Christmas? I know I can't. This year has just flown by! Today, I have a cute banner for you using the layered ornaments and snowflakes from Retro Cafe Art. You would never believe how easy this banner was to put together! For real! And I'll bet money you have all of the supplies I used here already in your stash. Some pretty Christmas themed scrapbook paper, embossing powder and a heat tool, some super awesome alphas, glitter, and Ice Resin is all you need! Oh, and no worries if you don't have Ice Resin. You can use Diamond Glaze but you won't be able to fill the bezel wells. Trust me. It looks just as adorable without the resin. I chose to use Ice Resin because (shhhhhh....don't say anything) the stuff scares me! YES! It scares me. But after doing this bad boy, it's not nearly as daunting as it was before. Wanna know how I put it all together? Step 1: Cut your pretty paper to fit each piece you want covered. I used Mod Podge to glue my paper down. Step 2: Use your embossing powder and heat tool to cover the snowflakes. Step 3: Decorate each piece with beads and glue down the frames. Mix your Ice Resin according to the manufacturing directions. Sprinkle in some round beads or glitter and let it cure according to the instruction. Step 4: Prepare your awesome alphas with some paint and for extra sparkle, add some glitter. Dump that stuff all over! Step 5: Place your alphas inside the wells created by the frames and dump more resin to fill and cover the letters. I sprinkled some more microbeads to get a layered effect. It also helps to use the leftover resin and paintbrush and spread it all over the whole piece to seal it. Attach the pieces to ribbon with hot glue and add some Bohemian Jewels to the ornaments' hanging holes. This year is the first time I've ever worked with any of the Tombstones from Retro Cafe Art Gallery. You see, every year, Kristin hosts a Tombstone swap and every year, I've always watched from the sidelines, always a bit nervous to commit and play along. Some of that apprehension was due to logistics in that I live overseas. I was always nervous that my submissions would arrive late or not at all. I was also worried about damage to them during the shipping process. I also worried about my level of talent. I mean, I have seen most of the tombstones after they were altered and decorated and they were just mind-blowing. To throw my little creations into that kind of mix was daunting, to say the least. Fast forward and here we are and it's 2016. I decided, "What the heck!" and decided to play along this year only it's not a swap. It's a challenge. And I'm not a regular participant. I'm a design team member. A much different perspective and the guise of participating under obligation is one heck of a motivator. After all, I can't be a spoil sport simply because I'm a scaredy cat right? So there you have it. My 2016 Tombstones, all dressed right and purty for this Halloween shindig! Wanna know how I did it? Step 1: Using the "Witch Hunt" digital collage, trace, cut and glue down your chosen designs to the tombstone. I used Mod Podge. If you don't plan on painting or inking the paper, you can seal it with a coat of Mod Podge over the top. I chose not to since I chalked my edges. Step 2: Prep your embellishments with a coat of gesso. I do this so that when I paint them, the color holds true. Step 3: Start embellishing your embellishments! I used paint and glitter over mine. The Finnabair Crackle Pasts gives my zombie arms a nice, scaly look. I dusted some dark brown mica powder into the crack and wiped clean with a baby wipe. This one, I covered in glitter. Step 4: Wind wire around a skinny skewer and clue your mini bats and pumpkins to them. Attach to the tombstone with hot glue. Step 5: Finish your embellishing and assemble your tombstones. I glued moss onto my bases and added some finishing touches. Be sure to jump in on the fun in the Retro Cafe Art Gallery Community and order your 2016 Tombstones today! A $25 gift certificate to the Retro Cafe Art Gallery store is up for grabs with this year's challenge. Be sure to use #2016Tombstones in your entry post! I just love shadow boxes and curio cabinets. They treasures stored inside, the mysteries, the stories, they commonality between each item it holds just gets my imagination flowing. I've only ever done one multi-cubicle shadow box before, I figured it's high time to do another! This "Curious Curio" is just filled to the brim with the curious, the odd, and the weird. Everything just seemed to come together so easily. It's super easy to put one together if you use the Keepsake Curio Shrine kit, Relics & Artifacts, and some found objects you most likely already have in your stash. Let's take a stroll through the curious and the odd and learn how I put this beautiful collection together. Step 1: Prime your Curio pieces with some lovely VerDay paint and patina according to the package instructions. Don't be shy with it either! My beautiful color variation is the result of three coats, the last coat being applied with the previous coat still partially wet. Step 2: Assemble your Curio once the VerDay has completely cured and dried. Once your adhesive has dried, start hacking into some really cool paper for you cubby backgrounds. I used a mix of Graphic 45's "Steampunk Debutante" and "Old Curiosity Shoppe". Step 3: Add a strip of paper around the outside of the curio if you choose to cover the assembly notches. I like decorative edges so I "aged" some white Fleur Dresden trim with VerDay to finish it off. I used a chalk edger to make the very deliberate "lines" on the paper and age it a bit. Step 4: Now it's time to focus on the cubbies! I used the Circle Shrine Trinket in one cubicle and the result is beautiful. Use some Art Alchemy Paint and Crackle Accents to dress up your trinket and a micro head from the "Figureheads" set of Relics & Artifacts I ended up going back and finishing mine off with copper studs and Finnabair Micro Beads. Step 5: What is a "Curious Curio" without some tiny vials of questionable substances? Decorate your vials with medical labels from the "Antique Medicine Bottle Label" collage sheet. I also filled my vials with Art Stones and more Micro Beads. I dressed my vials up further using some jute and leftover Dresden. Step 6: Let's add another Trinket shrine, a head with a mind's eye! I painted my Head Trinket shrine with some more Art Alchemy paint and dressed him up with more micro beads. I toned down the beautiful vivid green with a chalk edger. Step 7: Let's add some body parts but without the "eew" factor. The "Milagros" set of Relics & Artifacts are PERFECT for this curio. Now some of the best results happen because of happy accidents and this is one of them. To get that cracked, pivoted, aged porcelain look, apply a REALLY thick coat of Crackle Accents and let it set overnight. The result will be nice crackling along the edges but a shiny and "clean" surface on the main areas. To get the pivots, I used a pair of pliers and actually hit the pieces directly. Be careful and don't beat them but don't be gentle and tap them either. Once you think you've done enough damage, brush over the cracks with Artisan Powder and wipe the piece down with a dry napkin. Step 8: The "Treasure" cut-out that serves as my title uses a technique I learned from the amazing and lovely, Linda Cain. I have ALWAYS adored how she does her paint work and blending. She shared her secret with me and I could not believe how simple it was. She paints the piece with one color. Once dry, she does the edges with a second color using a sponge! Brilliant right?! I need more practice but I still love how mine turned out. Add a drawer pull to finish off the top. Step 9: Finish assembling your cubbies as you feel. I used a Frozen Charlotte, a vacuum tube dressed in a Fleur de Lis crown, and some found objects and beads I had in my stash. Would you believe that the gold eagle piece is simply the top to an old cologne bottle? Dig around and use your imagination! These curios contain endless possibilities and the fun is limitless. Be on the lookout for more of these coming from me! Under the Sea Crabby Fun! Summer is in full swing and I am feeling all things "Under the Sea"! These stand up crabs from Retro Cafe Art are just the cutest things! Using some items you probably have in your stash already makes dressing these up super easy. I've had these Prima light bulbs forever just waiting for the perfect project to use them on. Some VerDay paint makes these crabs look aged and refined. I used iron, copper, and brass. Put those seed beads to use as the perfect accent for highlights or giving the sea corals a look of bubbly perfection. For the posts, add Finnabair's micro beads for texture. Finnabair's Art Stones provide the perfect sea bottom for my crabs to lay claim to. Would you like to make your own? Follow along for a quick tutorial! Step 1: Apply VerDay patina paint according to the directions. Set the crabs aside to dry and cure. Step 2: Use a foam brush to apply gesso to the base. I dabbed it on so that when it dries, it will have a grainy look between the large art stones. Step 3: Using gel medium (it's totally THE BEST adhesive), sprinkle art stones onto the base. Tap off excess and set aside to dry, preferably overnight. When dry, spray with a gold toned spray mist. I used Prima's Color Bloom Spray in Empress Gold. Step 4: Once the patina paint has dried, glue on Prima vintage light bulb onto the body. Brush on gel medium onto the post and sprinkle with micro beads. Step 5: Glue seed beads on using an adhesive like Diamond Glaze. Embellish posts and the edge of the base with rhinestone trim. Step 6: Paint coral pieces and add beads. Assemble crabs and glue into place. I liked how mine tilted to the sides a bit so that's how I glued them. Prima Color Bloom Spray "Empress Gold"
Heidi Swapp Color Shine "Coral"
It seems that Spring is in full swing and Summer is hot on its heels. Here in Okinawa, that means we are in rainy season as well as the early part of typhoon season. It's been rather dreary lately so I needed a burst of "Spring Meets Summer" sunshine in my life. Cue my "Springy Summer" Santos doll complete with an ATC birdcage bottom. She is just so peaceful and serene. Just looking at her makes me smile and just savor the moment. Her not-so-gilded cage holds what I think to be hope for a bright and full bloom sunshiny season. And because I'm a sucker for details, we can't leave out her vivid body and it's adornments. How did I put her together? It's actually quite easy and I use techniques and products you probably already have in your stash! Step 1: Find some lush paper you just can't get enough of. Trace the outline of her rather svelte torso. Cut and adhere using gel medium. Don't have gel medium? No problemo! Bust out that glue stick or tape runner and get to stickin'. Tip: If you use a digital collage like I used from Tumble Fish Studio and printed it out using an inkjet printer, spray a fixative over the top before applying the gel. Step 2: Grab yourself the beautiful "Wings" collage sheet from Retro Cafe Art. Adjust the size of the wings using editing software. Simply cut, paste and apply some sparkly goodness to make them shine. I used some Stickles on mine. Step 3: Let's give this li'l mama a face! I find the best mould for these types of faces is by Sculpey. It's the "Art Doll" mould. Squish some polymer clay into the mould and pop it out once you're satisfied with the shape. Bake your clay castings on a cookie sheet covered with parchment paper in a preheated oven at 275*F. Typical baking time is 15 minutes per 1/4" thickness. Once your clay has cooled completely, mix together some acrylic paint to achieve your desired flesh tone. Set aside to dry completely. Tip: No parchment paper? No problem! Just cover your cookie sheet with aluminum foil. Also, her headpiece in the finished photo is cut from the "Valentine's Day Patterns" collage sheet. Step 4: Let's get busy on this cage! Dig through your stash and pull out those ancient embossing powders because they are going to get a workout today! I used powders by Piccolo because I love the depth of color they have but you can use whatever your heart desires. Apply and emboss just like you used to do back when heat embossing was cool. Step 5: Once your pieces have cooled, glue the doll to the top of the cage and attach the hanging chain for the flower piece using hot glue. Cut a piece from the Black Scroll dresden trim. Remove any undesired pieces so that your scrolly piece fits nicely at the doll's waist. While you're at it, spray some of the Mini Scalloped dresden trim bright yellow. Let it dry to the touch and glue it onto the top of the cage. You can glue it all the way around if you choose but it might make assembly of the cage a little difficult. For this step, I only glued the front border. Step 6: Now it's time to work some magic. Grab the pieces of the cage and apply Verday paint according to the instructions on the paint. Since I wanted a two-tone look on the door of the cage, I taped off the center design so that it wouldn't be affected by the iron paint. Once the iron paint had oxidized, I went ahead and used brass on the inside. Tip: I tried a little experiment to see if the oxidation process would be affected if I used a heat gun. The answer to that is a resound, "YES!" It not only hampers the process; it completely nullifies it. Let the patina spray do its magic, which means you have to have some patience and about 4 hours of time. Since I did a two-step process, total curing time was about 8 hours. Step 7: Just look at all of that patina goodness! Patience really does pay off when using this paint. Now it's time to glue together the pieces of the cage. For this step, you want to use a really strong adhesive. I busted out my "mama means business" glue, E6000. Step 8: I hope you left your glue gun plugged in. To apply the mossy floor, just squirt that glue all over the bottom and press the moss directly into it. Remove any glue strings and watch your fingers. Step 9: Dig through your stash or just go ahead and pull the trigger on the "Flora" Relics & Artfacts® set you've had in your Retro Cafe Art cart for ages now. Lay down a coat of gesso and let it dry. Once it's dry, apply a coat of whatever color you choose. I went for a tone on tone look to get some depth on the flower. That Royal Red metallique paint looks simply lush against red acrylic paint. Just sayin'. Tip: Use Inka Gold paint in Lava Red for added pop on the edges of the flower. Step 10: Attache a good sized jump ring and hang your flower from the chain. Glue butterfly to the flower if you decided to add one like I did in the finished photos. Step 11: Doodle away! I doodled on the door of the cage, the scrolly piece on the doll's waist, and the doll's wings. And there you have it! It seemed complicated right? But it's not. It's mostly a lot of "paint drying" time but the patience totally pays off in the end. The magical, enchanted and mystical world of fairy tales is one that is always nostalgic and wondrous. I decided to create my own piece of magic using the Castle Antiquity Shrine from Retro Cafe Art. Magical right? This shrine houses a Coat in Arms all dressed up in my favorite paint system ever, VerDay. The shield is part of the Mythos set of Relics & Artifacts. To give the shield that regal "coat of arms" look add a battle axe and sword from the Medieval Weaponry chipboard set. For the Griffins standing guard, break out that ol' heat tool and those embossing powders you keep stashed away and put them to work! 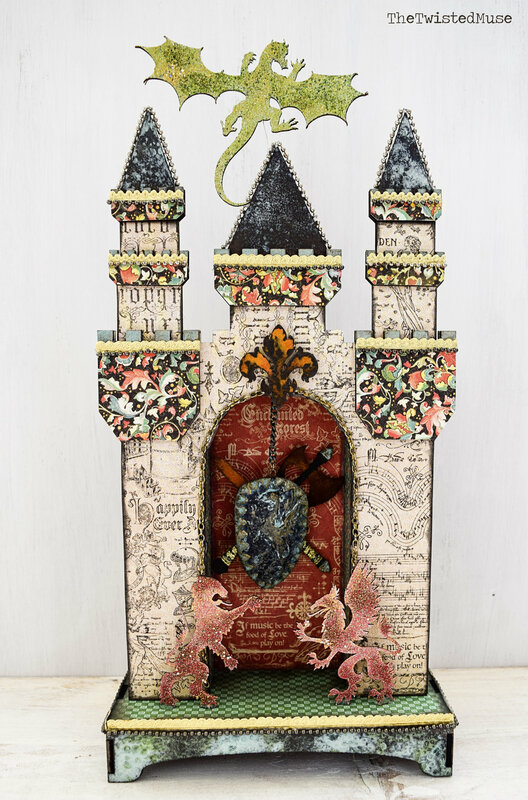 I simply covered the castle pieces in beautiful paper from "Enchanted Forest" by Graphic 45 and embellished with Dresden trim. Some beautiful ball chains or chain from old necklaces add a nice medieval inspired touch. Just be sure to adhere them with a good, strong adhesive like E6000. For our evil and menacing dragon, get out that heat tool and embossing powder again. It really is that simple. I love bringing the magic of fairy tales to life in my own way. Why not reach into your imagination and bring some magic to life? Hello! I hope everyone is doing well. I know I've been doing great and keeping busy. Speaking of busy, I have another ribbon tutorial for you today. How about sassing up your front door or another space with wreath that just wreaks of college spirit? Especially with football season quickly approaching, this little project is perfect. My stepdad is a graduate from The "U", University of Utah, so that makes my mom and he huge fans. They go to as many of the games as they can. I made this wreath for him. Let's get started with this ridiculously simple wreath. Here's what you'll need. And I mean NEED! Just look at that glorious ribbon!! Stick that sucker into the wreath form. Keep making loops and cluster them together. Keep gettin' loopy and sticky and watch your wreath come together. In the time it takes you to gulp down an extra dirty martini, you end up with the fluffy ring of wonderfulness. "OOoooOOOooh" and "AAAaaaaaAAAh" at your fabulous creation. Make another martini. Ok. This step is optional but why not celebrate your wonderful wreath?? Paint your letter and add twine if you feel so tickled to. Once the paint dries, bust out that bad boy of a hot glue gun and glob the glue onto the back of the letter and plop it onto your fabulously created wreath. Sit back and "OOoooOOOoh" and "AAaaaaAAh" once more while polishing off that martini. Needless to say, I can't wait to box this up and send it on its merry way to its new home. A Few of My Favorite May Arts Projects....And A Tutorial! Hi everyone! It's that time for me to gear up and try to see if I can stay on the May Arts team for another term. I seriously love this company and the people who run it behind the scenes. If you are interested, you can check out the deets here. Now on to the business at hand. Here are some of my favorite projects I've made while on this team. First up is a wreath I made using burlap and some of the other textured and patterned ribbons available from May Arts. This wreath was made for the Craft & Hobby Association trade show in Anaheim this past January. Each of the flowers are hand made with the exception of the Prima flowers in the centers. Next up is a set of candles I made for my dearest friend, Liz. I bought some plain white candles then stained them using some alcohol ink. Once the ink dried, I applied some Mod Podge to the lower halves and rolled them in a chunky clear glitter. To seal in the ink, I sprayed an acrylic sealer onto the candle. To dress them up, of course I used some May Arts ribbon. Please note that because of the plastic glitter and the acrylic sealer, these candles are not burnable. If you want to burn the candles, just leave off the glitter and the sealer. Finally, I have a HUGE tutorial for you. By "huge", I mean it's a long one. When you hear "ribbon", what is one of the first things you think of? I think of cute hair bows. But see, I have a problem. I cannot tie a "pretty bow" to save my life! I am what I like to call "bow challenged". With that said, I came across an amazing tutorial that didn't require any actual tying! SCORE! Mark your ribbon at 3.5" from the end using a marker. It is easier if you use a marker that bleeds through to the other side. There is no need to worry about seeing the marks as these are only your stitch lines, which you will see later. Begin marking your ribbon every 6 inches. You will end up with a total of 5 markings on your ribbon. Begin stitching using a running stitch. Start with your first marking you made and stitch from the bottom up. Flip the ribbon over so that the other end is going the other way and continue stitching. You should be looking at the backside of your ribbon. I used a ribbon that has matching front and back so it is hard to tell. Continue stitching back and forth until you have stitched together all of your marked lines. Gently pull the thread and bunch the ribbon down at the knot. Shape your bow the best you can. See? You can't see any of the markings you've made. Next, wrap the thread around the gathering and take a few stitches to hold the bow in place. Glue the bow to the barrette clasp. Take the 5" length of ribbon and fold it into thirds lengthwise. If you have decided to use an embellishment, now is the time to glue it onto your bow and call it finished. Tie a loose knot at the center of the ribbon then glue it to the bow. Here's what it looks like attached. Secure the ends onto the underside of the barrette using hot glue and trim the tails. Finally, sit back and admire! Ooooh! Aaaaah! See?! I told you they would be easy as pie. Good morning Muses! I hope you are all doing well! If you are here from the GlobeCraft & Piccolo blog, then you must've seen my tutorial on how to put this little gem together. Now I'm going to show you how to actually USE this piece on a card. As you can tell from the markings on my (much used, abused, and never clean) cutting mat, this piece is approximately 5.5" tall. That's a big honkin' embellishment. The key to using over-sized elements is to keep everything else to a minimum. Also, since the paper I used on the teapot is pretty busy, the background should be simple and neutral so as to not take away from the focal point, nor overwhelm the eye is too much awesome. I chose to use kraft paper with a darker brown matting. Anything else you add needs to be understated and subtle. For my sentiment, I used an epoxy sticker from "Cashmere Dame" and put it in a discreet spot. Finally, to add that final "something", I used my brand new, nifty glittery hot glue sticks and added some glittery dots along the sides. Once those cooled down, I called this card done! Thanks for taking a look and if you haven't checked out how I put together the teapot, please head on over to the GlobeCraft blog and give it a read through. It really is a lot simpler than it looks! Follow my blog with Bloglovin Good morning! I have a very cool little tutorial to share with you today using some awesome Globecraft Memories and Graphic 45. Piccolo 3D Enamel Gel in "Metallic Gold"
Step 1: Punch the pieces of the ornament out and heat emboss the elements you wish. Step 2: As the heat embossed pieces are cooling, add the 3D gel to the ring at the top of the ornament as well as the numbers of the clock. Step 3: Cut your scrapbook paper to the appropriate size and shape of the pieces you would like covered. Step 4: Use a needle to punch the hole in the center of the oval scrapbook paper so that the brad will slide in and hold the clock hands in place. This is the backside of the oval piece after my paper has been glued on. Step 5: Start assembling your ornament. This is a good time to adhere the gears where you want around or inside the frame. I glued mine between the layers so that they stick out along the sides. Step 6: Finish assembling your ornament and add your final touches. I chalked my edges and added a ball chain around the outside of the bubble. This really is a fun and super easy project to put together. For another tutorial on how to use a bubble frame as a stand up card, visit the GlobeCraft Memories blog and get crafty! Who Says Steampunk Has To Be Brown?! Hello Muses! I hope you are all doing well! I have another post for you today with a tutorial. We all know steampunk is all the rage. While I love the traditional steampunk colors of brown, cream, black, and metals, I think it's great to shake things up a bit. I made this pendant using GlobeCraft Memories' bookboard bezels. This pendant is super easy to put together. It's quick too! Here's how to do it yourself! 1. Pick a large book board bezel. I used the large teardrop. Then run it through an embosser to add some texture. I ran mine through a Cuttlebug using Tim Holtz's "Diamond Plate" embossing folder. 2. Choose an embossing powder and heat emboss. I used "Girls' Night Out" and did a total heat set. 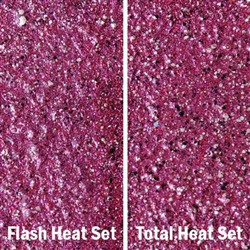 You can do a flash heat set for even more added texture. 3. Embellish to your heart's delight. I wanted to keep a steampunk look to mine so I used Prima's awesome gears and a Prima light bulb. It really is a quick and simple project for anyone. For another steampunk tutorial with some awesome heat embossing, check out the GlobeCraft & Piccolo blog! The May Arts Christmas Blog Hop Continues! Today is day four of the May Arts Christmas blog hop. If you missed the first three days and want to catch up, head on back to the May Arts blog. Today's line up is below. You should've arrived here from the May Arts blog. There's also a chance for a giveaway! Here's my project. I have always wanted to dress up some candles. I picked up some plain white candles and took my alcohol inks to them. Add some marvelous May Arts ribbon and some embellishments and I now have some pretty candles! Normally, if you just use alcohol ink, you can still burn them. These candles aren't burnable because I used an acrylic sealer as well as mod podge and plastic glitter. These are strictly for looks. The "usual" way to use alcohol inks on candles is to drip them onto the candle and let them run. Then roll in the excess ink that drips off the candle. For mine, I wanted a more subtle look. I applied the alcohol ink using my alcohol ink applicator and let it dry. Then I sprayed an acrylic sealer over the whole thing. 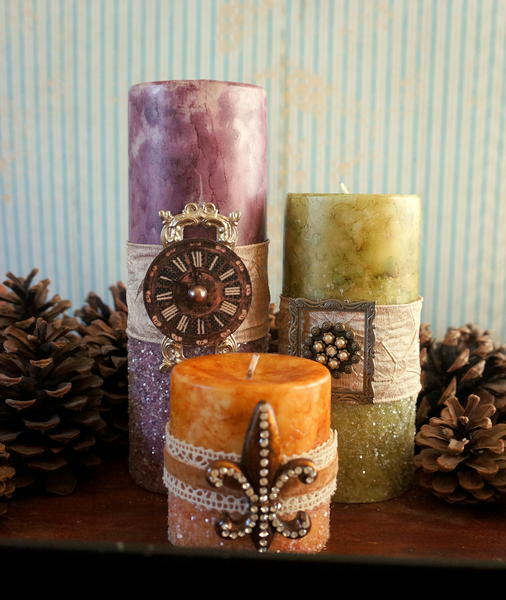 To get the glitter on the bottom, just spread some mod podge onto the the candle and roll in clear, chunky glitter. Look for pretty finds and hardware around your house or in the dollar bin at the store. To be entered in the giveaway, just leave a comment along the way! You'll be entered into the drawing for FOUR SPOOLS of your choice from the Ribbon Lady! Thanks for hopping along with the Ribbonistas. Your next stop is Gini.